Welcome to the Castle Inn and Restaurant located in Perth-Andover, New Brunswick, Canada. An ideal destination for those wishing to escape the hectic pace of daily life, we offer 4-star Canada select accomodations situated on a hilltop overlooking the St John River on 200 acres of woodland. Perfect for a romantic couples retreat, group bookings for a family reunion, a corporate getaway, the weary business traveller, or the outdoor enthusiast — we are the ultimate destination. Our inn is located only minutes from the Trans-Canada Highway and the Trans-Canada Trail system used by cyclists, hikers, snowmobilers, and skiers. We are situated 1 1/2 hours north of Fredericton and are considered by many of our regular guests to be the half-way point between Montreal and Halifax. Stay for a few nights and make yourself at home—you’re always welcome at the Castle Inn! 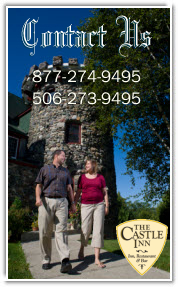 Please contact us for your Castle Inn reservations at 1-506-273-9495.